Chip Container 1500L Tipper Container | SalesBridges B.V.
Chip Container SBTCTK1500L. Suitable for forklift. The SBTCTK Tipping Skip or Chip Container is equipped with a special scissor dump mechanism, which ensures smooth emptying. Base frame and container are connected by means of a sturdy connecting arm, which ensures optimal tilting. Equipped with a safe and stable unlocking mechanism, which can be operated by a pull cord from the driver's seat of a forklift. 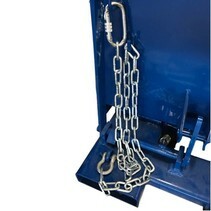 For additional safety a safety chain can be connected on the forklift. Add a Safety chain and cable set to your order. Thanks to the use of high-quality steel sheets and excellent finishing, the Tipping Bins are very durable and robust. Finished with powder coating in standard color RAL5010.